Devil's walking stick (Aralia spinosa) is a spiny, few-branched, flat-topped deciduous tree. It is found naturally occurring in eastern North America from New York and Pennsylvania south to Florida and west to southwestern Iowa and western Texas. Mid to late summer, it produces large clusters of small white flowers, followed by the emergence of purple blackish berries early to mid fall. Flowers: White, fragrant and showy flowers in the summer, depending on whether the tree is male or female. Leaves: Bipinnately compounded; green to yellow ovate leaflets. Bark: Dark brown or dark gray; spiny or furrowed. 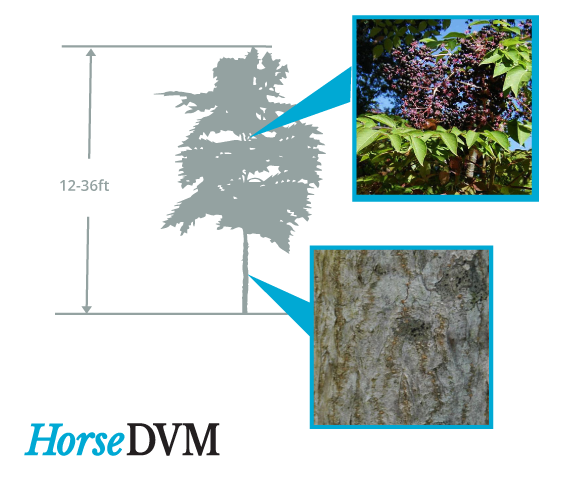 All parts of devil's walking stick can be mildly toxic to horses if ingested. They may also get contact dermatitis from rubbing up against parts of A. spinosa. USDA SPECIES: Aralia spinosa Fire Effects Information System. 2018. Aralia spinosa NC State University. 2014.